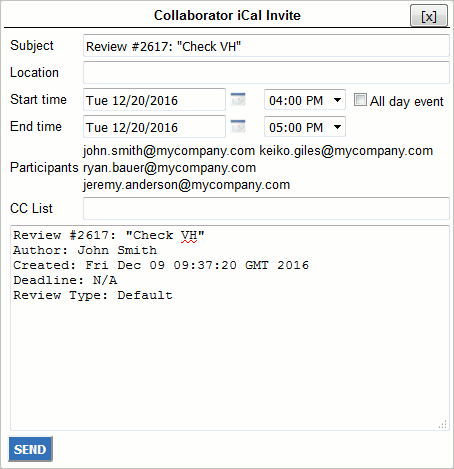 Calendar notifications may be useful for scheduling formal meetings on a particular review. 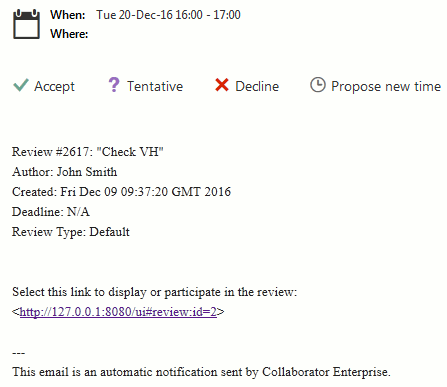 Any one of review participants may create an iCalendar invitation from the Review Screen (see below). Once created, all the participants of that review will receive email messages with a meeting proposal on specific date and time. Calendar invitations are sent via email. Therefore, your Collaborator administrator should configure SMTP server settings and enable email notifications. Calendar invitations use iCalendar format. To process them correctly, your email client should support this format. Otherwise, the invitation will be interpreted as an ordinary file attachment. By default, the user who has created the invitation is assigned as the organizer of the meeting. This behaviour can be changed by the Use iCal organizer setting. The text content of Calendar notifications is defined in the List Calendar Invite notification template. Open the desired review in the Review Screen. Scroll to the Participants section. Click the iCal button in the section's upper-left corner. Specify date and time of event, (optionally) specify location, modify event description, add other participants and click Send.